Seems pretty cool! 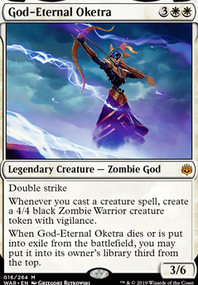 I'm not entirely sure if I have suggestions exactly, but cards that come to mind that I use for my Orzhov-colored deck with tokens are Luminarch Ascension and Divine Visitation (though the latter may not play well with Krenko, Mob Boss by turning the goblin tokens to angels). Finale of Glory might be worth a look at when WAR drops soon, as well. I tested this against multiple opponents and lost a vast majority of the time. The games I did win, I didn't see the enchantment and the opponent had a bad draw. Here's what happened: We have some major mana issues. I couldn't draw enough land and the lands I drew were the wrong color. This happened game after game after game. The one game where I actually saw divine visitation, all three got Absorb one after another. We can't talk about how to SB if the main deck isn't clicking on all cylinders. I understand your reasoning behind dropping Divine Visitation to 3, but that's the wrong reason. Fix the mana, not the queen card. For this build, 22 is not even close to enough. 5 mana by turn 5 is 5/11×60=27. That's how much you're going to need. Now there are tons of 3-mana artifacts that give you any color so that might help; may even get our enchantment on the table turn 4 instead of 5. Otherwise it's shock lands for you. As for card choices, risk factor didn't do anything for me. When I needed cards, he just took the damage. Lots of other stuff looked great in my hand right up until I died. Might I also suggest Duress as a means of not only protecting the enchantment but also getting some valuable Intel. Anyhooos that's all I got. Fix the mana issues and get the engine humming. Hit me up and then I can help with SB ok? Solid list! 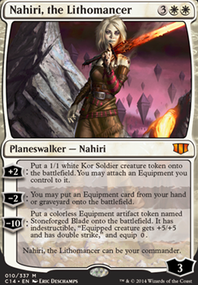 I love creature heavy decks and the focus on "get goons, draw cards" is appealing, and I'm sorely lacking in white in my decks so I'll probably end up building her. Have you considered Divine Visitation ? 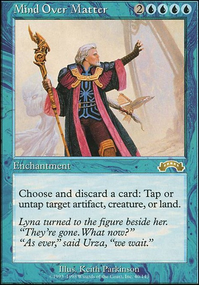 Makes all tokens 4/4 angels with flying so that would be wild with her ability and others on the list, like the Fabricate from the Angel of Invention . Have you tried running a Divine Visitation ? I know you're trying to cut cards, but there are some cards I can't resist suggesting. Resplendent Angel is a good mana sink and can pump out tokens at a very fast rate if your opponents aren't careful. Mask of Avacyn or Champion's Helm can help protect your commander or another creature from anything save a boardwipe or going through the artifact first. 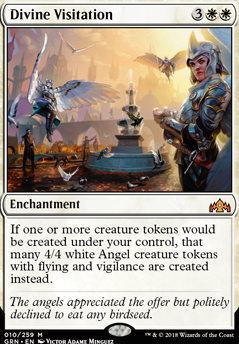 You might want a Lyra Dawnbringer , as you have a few Angels and you can make Angel tokens with Divine Visitation . Vedalken Orrery is a good all-round card. Have you considered Cathars' Crusade ? 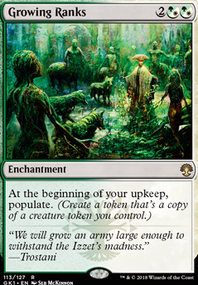 Especially with all the creature tokens you're pumping out, you're going to make your guys pretty beefy. I'm not a big fan of rootborn defences as it only creates a single token copy and you have better things that give indestructible or pseudo-indestructible. Other than that, I don't see much that I think you could cut. The list looks pretty good. 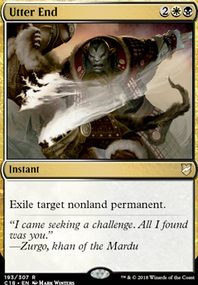 Have you tried advertising on the "Advertise your Commander Deck" thread? You might get some more trained eyes on this deck than me, as I don't play EDH that often and only just build decks. 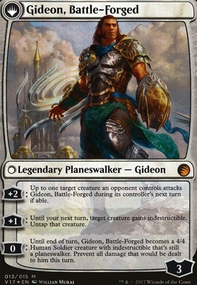 What do you think of Divine Visitation its kinda slow but my biggest gripe when playing superfriends is flyers killing my planeswalkers and this turns all our token producers into actual threats with vigilance. On that note, Serra the Benevolent might make it into my build too.